Mexico stands between the Kiwis and a trip to Brazil. Once upon a time, opposing teams feared going into Estadio Azteca. 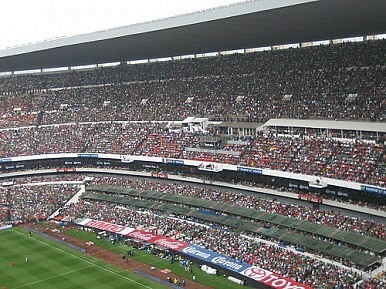 Whenever the Mexican national team had an important match, it was always staged in the imposing, frenzied 100,000-plus-seat cauldron at high altitude. The hapless foe would often be served up as a sacrifice, as if the stadium was Tenochtitlan. But on Wednesday, New Zealand’s All Whites will be arriving at Azteca brimming with all the confidence of the conquistadors of Hernan Cortes. The Kiwis will be seeking their second consecutive entry into the FIFA World Cup in a two-leg playoff against traditional powerhouse Mexico. Next Wednesday’s encounter in Mexico City will be the first of 17 matches held over two weeks that will decide the final 10 berths to next year’s World Cup finals in Brazil. Though New Zealand failed to advance out of group play in the 2010 World Cup in South Africa, the national team gave a good account of itself, drawing all three matches, including a 1-1 tie that helped knock defending champion Italy out of the tournament. Three years later, the All Whites want to build on that momentum after breezing through qualifying in the weak Oceania Football Confederation (OFC). But unlike for the previous World Cup, where New Zealand defeated Asia’s fifth-place team Bahrain in a two-leg playoff to earn a finals berth, this time the challenge appears to be much stiffer. Mexico is historically one of the best national teams outside of Europe and South America, having qualified for and advanced out of group play in each of the last five World Cups. New Zealand, however, isn’t going to face the history and brand power of Mexico. Instead, the All Whites will play an El Tri squad in disarray, having gone through four managers in a disastrous qualifying campaign that left them in fourth place (out of six teams) and needing a playoff victory to secure passage to Brazil. Will Mexico rediscover its prowess in the nick of time to survive New Zealand? New manager Miguel Herrera made his debut in Mexico’s 4-2 victory over Finland in a friendly last week in San Diego (a game this author witnessed). In that tune-up, El Tri looked somewhat rejuvenated with an up-tempo attacking style, though their defense remained suspect. The question in the two-leg playoff is never about which team has more talent. Despite its struggles, Mexico, even with an all-domestic league selection, still is the technically superior side. But having better players alone is not going to be good enough to beat New Zealand. If El Tri are “soft” – as they have been labeled throughout qualifying – the All Whites are the opposite of that. The Kiwis might lack top-line talent, but they more than make up for it with grit and physicality. They will try to get a goal from their power strikers Chris Killen or Chris Wood, and then defend to the death. The first-leg match at Azteca will be key. There was a time when opponents were lucky to leave the imposing stadium with a draw, but no more, and not against the current El Tri squad. Mexico won just once in its final five qualifying matches, with three draws and a loss to Honduras. The crowd, at 7,200 feet above sea level, is far less intimidating when there’s little to shout about. If New Zealand can emerge with a scoreless draw and force Mexico to fly 7,000 miles to Wellington to earn a spot in Brazil six days later, it’ll be in good shape. The Kiwis will host the return leg on November 19 at Westpac Stadium, where the 35,000-seat facility has been sold out for months. It was the site of their November 2009 triumph when they beat Bahrain 1-0 to seal a berth for the World Cup in South Africa. The All Whites will be hoping for history to repeat itself.